If you have received an email from "Anonymous Hacker" where someone’s threatening you about posting a video of you doing private and personal things, don’t fear. This is a scam. I give you the last 72 hours to make the payment before I send the video with your masturbation to all your friends and associates." Click here if you want to read all the message. "Hi, your account is now hacked! Renew the password right this moment! You do not heard about me and you obviously wanting to know why you are getting this particular message, right?" Just like technology is evolving day by day, blackmail is too. Now hackers take advantage of these technologies and looking new ways to scam people. These hackers use tools like “spoofing” to try to trick people, hiding their identity or pretending to be someone else. 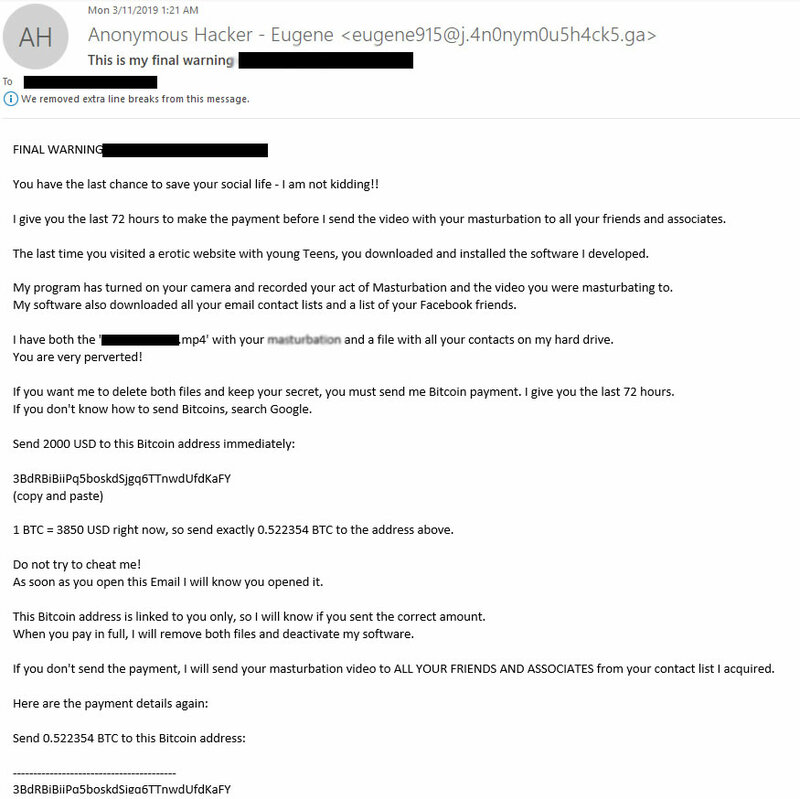 Hackers also make people believe they have access to their email account and passwords telling they have sent this email from their own email account. Usually, these threats come from the very same person’s email account that received it, as if they themselves sent the email. 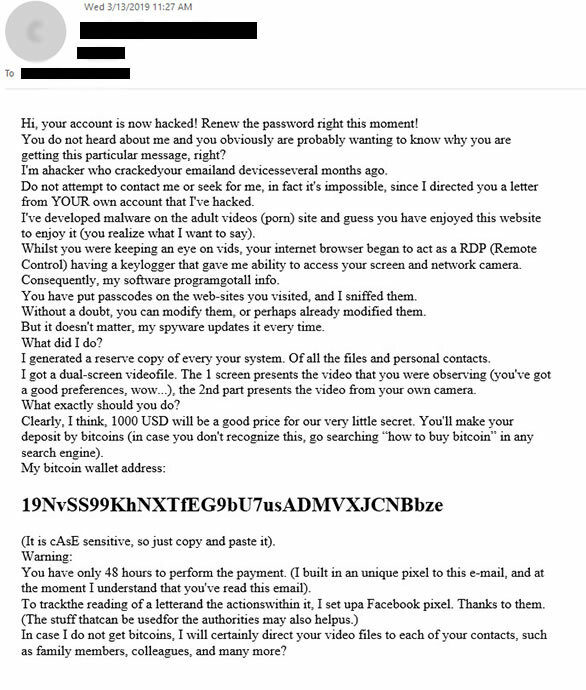 This is what the hackers do to make others believe they have access to their email accounts, and the most probable thing is that it’s fake, this is an example of “spoofing”. This way, the user thinks someone is stealing information and have photographs and videos from their webcams, with this, hackers get people to be afraid, and take advantage of the situation to ask for money. But it's possible that they do not even have access to your email addresses, and they have not hacked your computer, notebook or mobile device. To sum it up, the content on the email is a letter where it mentions that it has been installed a program in your computer or laptop (spyware), which records videos and registers every website you visited or every file you opened. They say that they have videos of you recorded from your webcam doing intimate things while visiting adult websites. They threaten you saying that if they don’t get an amount of money between $500 - $2000 (amount varies) in bitcoins (electronic division), will public said video and the websites you visited and will share it with to your contacts, and friends from social media. They also say that they are watching you and that it won’t matter if you change your passwords or erase the program that was installed since they have saved your videos. Hackers claim that if you pay the amount of money they ask for, they’ll delete the video, and everything registered on you. As well as deleting the program that was installed on your computer. Don’t fear, as said before, it’s possible that they don’t have any video recordings of you and not even knowing who you really are. These people use programs to recollect email addresses that are in websites and save them in a data base, which they use to send these emails to thousands of other people at the same time in massive form, waiting for any person to pay them. It’s as if throwing bait to the sea and wait for it to bite, without knowing the person and having videos nor information about you. Think about it, if they really have information about you, why not include an image (screenshot) of this said video where it shows you surfing those websites. If they really had information on you, they’d send evidence of the content to claim for the payment. Besides, there was never a moment in the letter where they mention personal information, nor refer to you by your full name. We don’t rule out and know that it is possible to “hack” a computer system or mobile system, but on the last recent months we’ve seen how these email sendings have been increasing on massive users, without proof of what they claim. Install and maintain an updated antivirus in your computer system that comes with antispyware and antimalware. Change your passwords, at least, every 3 to 6 months, and create them with a high difficult degree, do not use common dates, common words, or personal. Do not install unknown programs and don’t accept invitations from unknown people. Do not access personal or work email accounts from public devices. Avoid getting connected to public WiFi, like the ones they offer at restaurants, hotels, airports, these are unsecured networks and are opened to any hacker and can be used for bad intentions. We know that most of the time we want to use public WiFi from the place we’re at, but that is an opened way for these hackers to try to enter in your devices. We suggest you having an application that offers VPN, its initials (Virtual Private Network), which protects against malware or “hacker” and you can feel safer when using public WiFi. We recommend NordVPN; it protects you when connecting to public networks, and it even blocks ads that pops up at certain times. In conclusion, if you were to receive an email like the one mentioned earlier on this article, the most possible thing is that’s probably fake and are only trying to see if any victim will fall. Take advantage of our suggestions.